If you would like to do some of the work yourself and want to save money, the D-I-Y option may be the way to go. You may be inclined to work with your hands and feel you can take on this project. For some, they are building their house themselves and are looking for unique options with unfinished hardwood flooring. Still, others want the freedom to experiment on their own with interesting or unusual techniques relating to unfinished hardwood flooring. Finding unique hardwood flooring can be a challenge, but finding unfinished hardwood flooring can be very difficult. We understand this so we have made our unfinished hardwood flooring available to those who are searching for unique products. Almost all of our unfinished hardwood flooring comes from Canada. As times, we need to obtain lumber from the US. In either case, all the manufacturing of the unfinished hardwood flooring is done in Ontario Canada. Since all of our products are unfinished initially, our products may be purchased without installation or finishing. We can deliver to your location and the rest is up to you to install, sand, and finish them the way you want. As well, you may be comfortable with installing the flooring but may not be comfortable sanding and finishing the flooring. 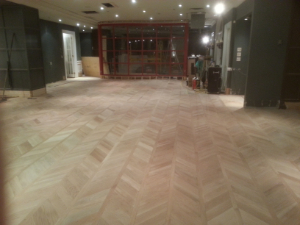 We can sand and finish the flooring only. We can also supply you with everything you need including glue, floor finish, stains, applicators etc. We ship our unfinished plank hardwood flooring throughout Canada and the US. We also sell to contractors, architects, and builders. We can even consult with you as you take on your project. If you have questions along the way that relate to installation or finishing of the hardwood flooring, just give us a call. If you would like more details about installation and finishing and whether you will likely be able to do it, we are happy to answer those questions for you and guide you in the process.